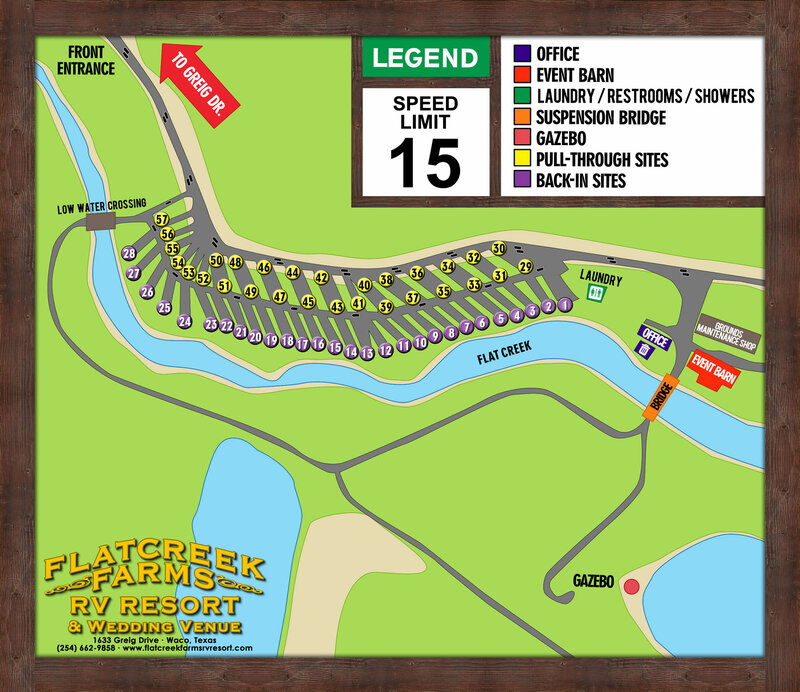 Welcome to Flat Creek Farms RV Resort! 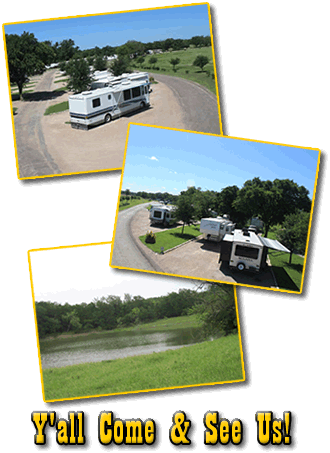 We are a family owned and operated RV park located in Waco,TX. Taking Exit 328 on I35 and a quick hop 1.7 miles East of the interstate on Greig Drive, we are the perfect mid-way point for travelers between Dallas and Austin as well as Snow Birds or Winter Texans as we like to call y'all! We are are a little slice of Texas Heaven with all the amenities of the city just a couple miles away. Our family is proud to have such a unique and beautiful property to share with travelers such as yourself. We highly suggest making reservations in advance of your stay to ensure we have an open site for you. 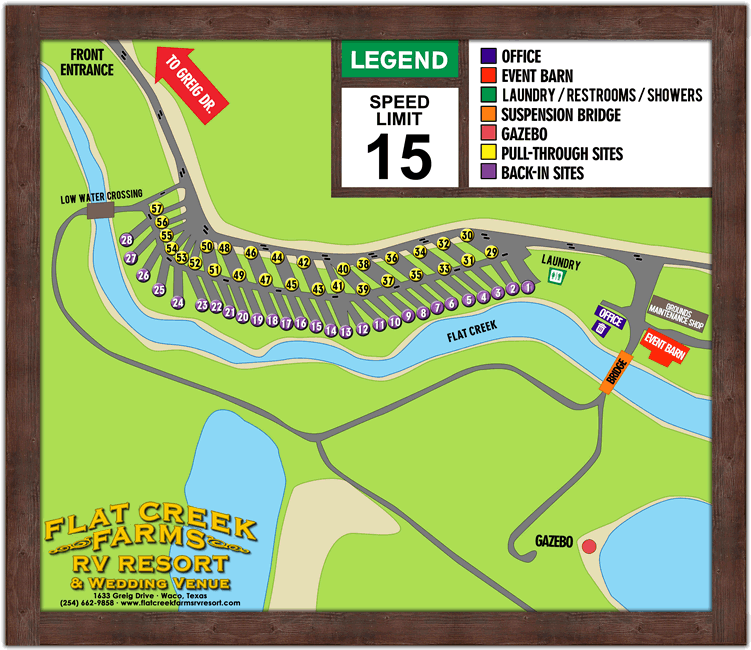 Click on the "Reservations" tab up top to pick your site and make your own reservation or give our friendly park manager a call on her cell phone at (254) 662-9858. Are you a fan of HGTV's "Fixer Upper" with Chip and Joanna Gaines? 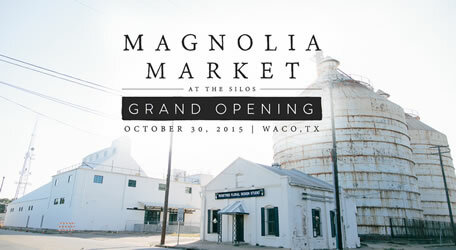 Swing by their store, Magnolia Market at the Silos in Downtown Waco. This must-see tourist attraction is located less than 10 miles from our park along with many other fabulous gems our community has to offer. Come see other local favorites like the Texas Ranger's Hall of Fame, Sports Hall of Fame, Dr. Pepper Museum, Baylor University or any of the Downtown Waco activities that are always happening! Are you a Baylor University fan? The new McLane Stadium is within 10 minutes of the resort right on I-35. If shopping is your thing, take a hop on over to Central Texas Market Place just across I-35 from us for all your retail therapy needs. For more information on these and other attractions, click on the Waco Attractions tab up top. For those wanting to experience being awakened by the rooster's crow, watching sheep and listening to the cow's moo, then Flat Creek Farms RV Resort will charm the boots right off of you! If you are a fishing enthusiast, you can spend some time along Flat Creek banks or around one of the five stocked ponds and enjoy some quality catch-and-release time. You may be content to just take a nature walk or bike ride around the farm. The hardest thing about visiting Flat Creek Farms is driving out the beautiful front gated entry to leave your new friends! New to Waco? Be sure to check out Magnolia Market, featured on HGTV's Fixer Upper, less than 10 minutes from us! Need a place to store your RV?? ?